The former members of the Arunachal Pradesh Legislative Assembly expressed satisfaction with the government decision to extend the retirement age of government employees from 58 to 60 with effect from 1st January 2018. 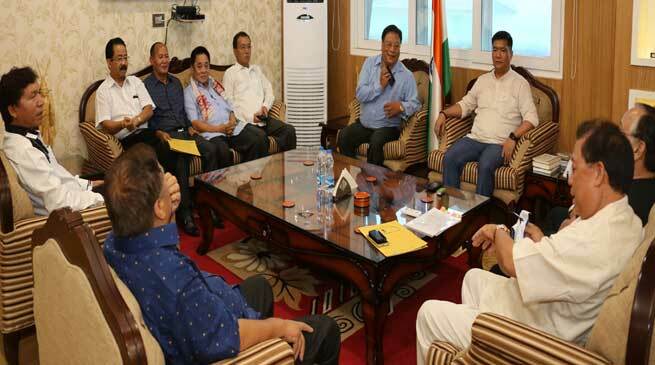 The members expressed that the government is doing everything that’s possible for welfare of all sections and assured the Chief Minister that they too would sensitize and make people aware of the government’s good intentions. Former members called on Chief Minister Pema Khandu at his offices here this morning. The delegation of former members included former ministers and MLAs lead by veterans W L Wanglat, Tsering Gyurme, Talo Mugli, M R Dodum and Nima Tsering. Also present were Tatar Kipa, J T Takam, Kito Sora, Anok Wangsa, Balo Raja, Gadam Ete, Nyato Rigia and several others. Wishing Khandu good health and a successful tenure the senior leaders discussed several issues including recent decision of the government to extend the retirement age of government employees from 58 to 60 with effect from 1st January 2018. The Chief Minister explained to the senior leaders that the government had to take the decision to maintain uniformity in retirement rules. He informed that one section of state government employees were already retiring at the age of 60, therefore to maintain uniformity the state government took the decision to fix the retirement age at 60 for all. When one of the senior members expressed the concern of youths that the decision would deprive them of government jobs for the next two years, Khandu assured it wouldn’t be the case. “We have done a lot of exercise before deciding to extend the retirement age of our employees. We are therefore aware of its implications on the employment front. We will create enough job opportunities in the government for our youths during these two years no matter regular employees retire or not. In no way our youths will feel the impact of the decision to increase the retirement age,” Khandu explained. He informed that the government is taking a time period of six months from 1st July to 31st December 2017 to undertake a massive and in-depth exercise within the government structure to normalize the impact of the decision and keep avenues open for educated unemployed youths. “This is a time taking – energy consuming exercise. So we have availed six months’ time. There is no other reason and people shouldn’t take it otherwise,” Khandu said on making effective the extension rule from 1st January 2018. The members also appreciated the assurance that all issues pertaining to welfare measures for ex-MLAs would be duly discussed in the next Cabinet meeting on a positive note.